We've already looked much more closely into the actual light emitting elements, HERE. The purpose of this post is document the remaining elements, notably the power supply that sits inside the base of each bulb. 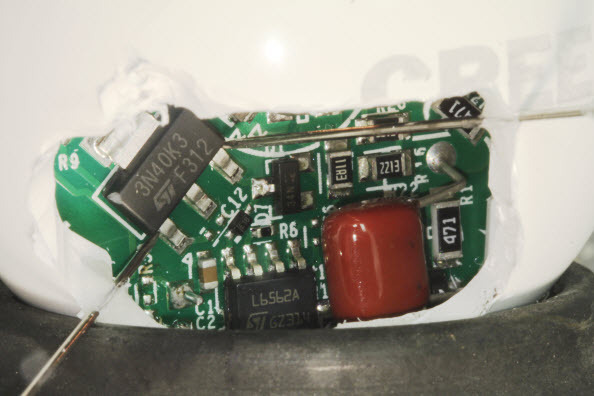 Extracting the power supplies from two different size bulbs, here is what we see. 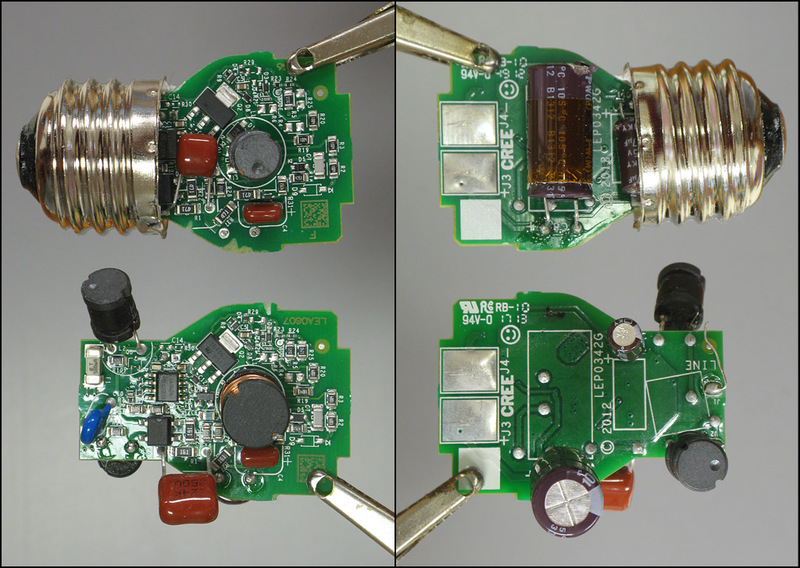 40-watt equivalent on the top, 60-watt equivalent on the bottom. It's not immediately obvious because I've prepared the two boards in different ways, but these two power supplies are almost identical. Actually the circuit board itself is identical; the higher power card has one larger inductor and capacitor, some of the resistor values are different, and the lower power card is missing one of two paralleled resistors (R25). Interestingly, the main filter cap is identical: 10µF 315V. MCC MB4S, a bridge rectifier. Combined with the three chokes and assorted capacitors on the card, this combination of chips points pretty strongly to a power supply that works as outlined in Chapter 3 of ON Semiconductor's Power Factor Correction Handbook. Very briefly, the circuit rapidly alternates between applying full line voltage across an inductor to build up a current in it, then switching connections so as to route that current into a capacitor that feeds the load. Armed with this new and intriguing information, of course I could not resist exploring further. So I set up some instrumentation and measured current flow and light output of three different types of lights: 1) 60-watt incandescent, 2) 40-watt equivalent Cree LED, and 3) Jansjö LED. 2. The Cree power supply does a pretty good job of making current track voltage like a resistive load. I was surprised to see sinusoidal ripple in the light output, and even more surprised to see so much of it. This Cree bulb has about 3 times the ripple of an ordinary incandescent. This would be no problem for photography as long as the camera is set to roughly 1/120 second or any multiple of that, but it would not be a good idea to use very short exposure times with these Cree bulbs. 3. The Jansjö light is basically the exact opposite of the Cree -- the input waveshaping is atrocious, but the light output has so little ripple that I can't even measure it. Of course I couldn't resist checking some of my understanding by directly measuring some of the innards of the power supply. Here are waveforms across the MOSFET switching element. 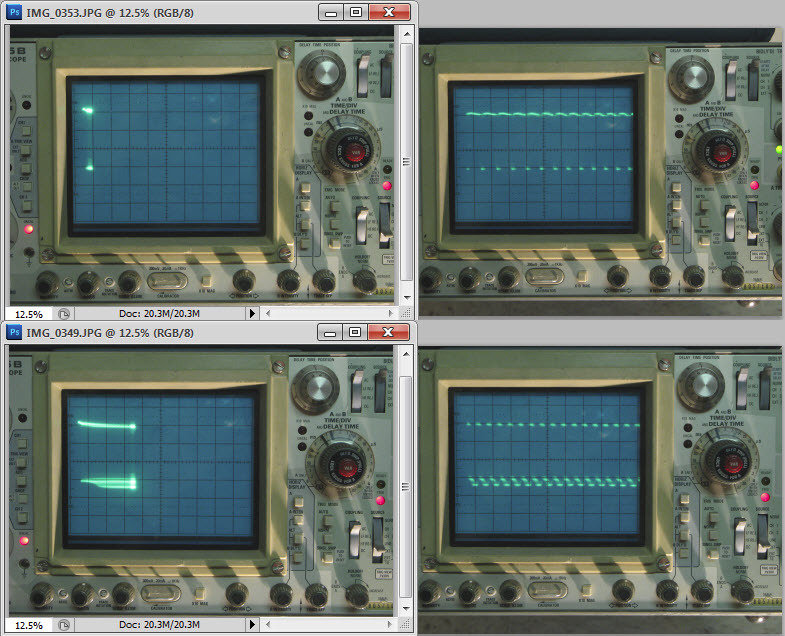 The first image is an overview of the waveform across 6 half-cycles of applied power. 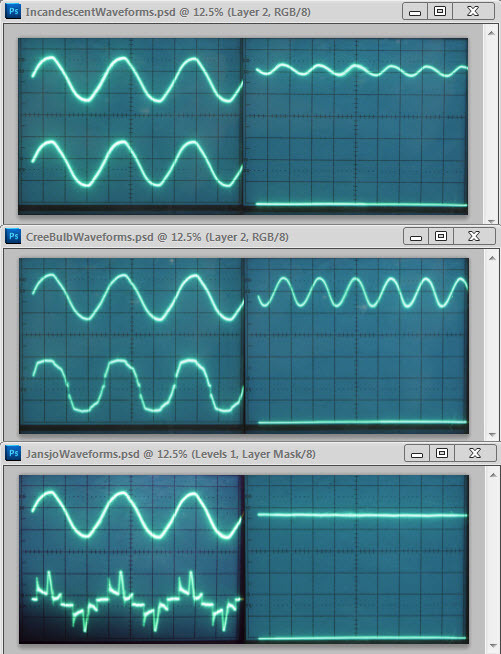 These other sets show a much closer view of the waveform at early and mid half-cycle. Left side shows the point in the cycle where the right-side closer view was taken using delayed sweep. 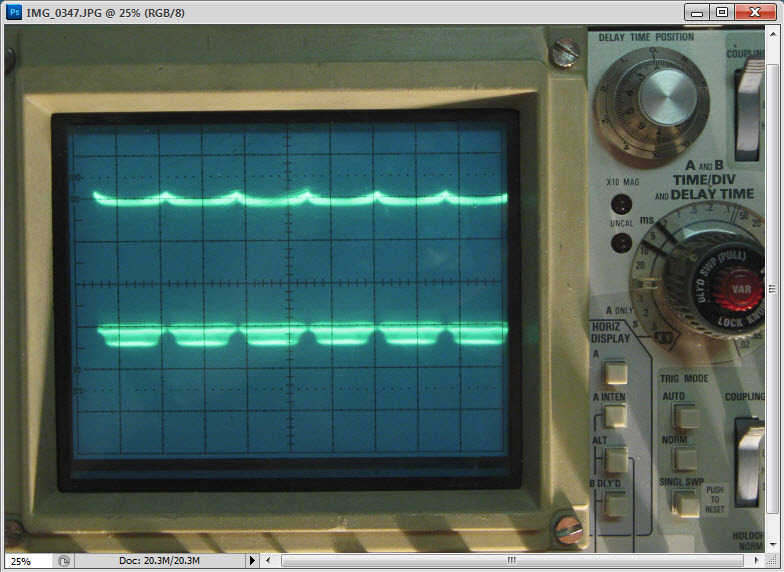 You can see the big change in duty cycle that accomplishes waveshaping of the input current. Sweep rate for these latter curves is 10 µs per division, indicating a switching frequency in the range of roughly 120-150 KHz. Anybody sticking with this post to the end, I salute you! 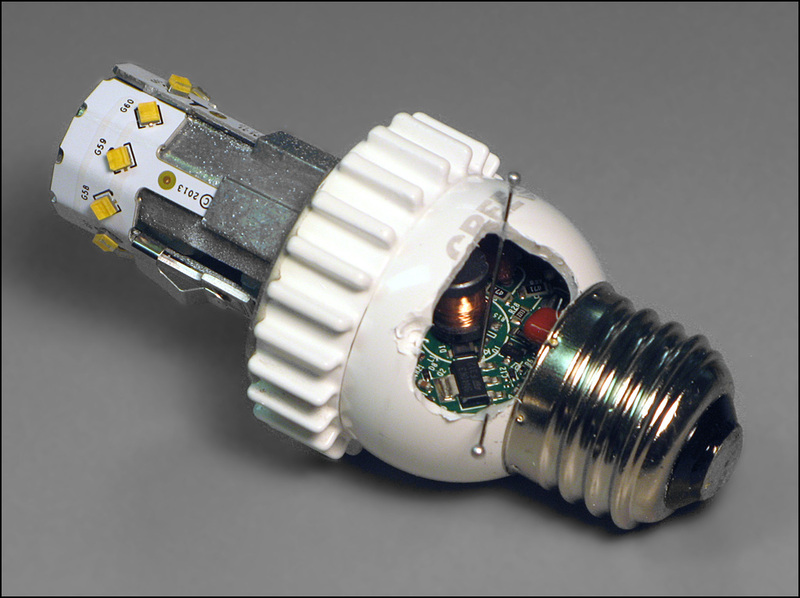 By observation, the Cree "40-watt" and "60-watt" bulbs are identical except for the sizes of a very few cheap components. Why is it, then, that my local Home Depot store sells them for $7 and $10 respectively? Interesting post. I am surprised at the Janso output given its rather 'artistic' waveshaping. Do you have any more info about what is happening here? Minor question on your test set up, what photodiode are you using, and what is its peak wavelength? I am in the market for the purposes of conducting similar tests, but have no experience with them currently. It would be hard to say with out knowing exactly what their pricing strategy is with out knowing the cost to make each item. However, it does sound a bit like a premium model, where one product is priced higher to give customers the impression that the higher priced product is better in some way(IE: more powerful).It is an established psychological effect that price point impacts a persons perception of a product. I am surprised at the Janso output given its rather 'artistic' waveshaping. Do you have any more info about what is happening here? I have not taken apart a Jansjö power supply or even tapped into the wiring to the LED. On the output side, my guess would be that it's a high frequency switcher set up to regulate drive current on a short term basis, much faster than line frequency. But at the relatively low power of those units, they could even be doing some analog regulation. On the input side, I have no idea what they're doing. That waveform looks like nothing I've ever seen before. Minor question on your test set up, what photodiode are you using, and what is its peak wavelength? I just used an "infrared phototransistor" that I pulled out of an old parts drawer. I think it's a RadioShack Cat. No. 276-145A. Definitely suboptimal for this application, but good enough to give general indications. I wonder if all of the manufacturing resources that go into these LED bulbs offsets the environmental impact over a simple tungsten filament bulb. Maybe in the end they aren't really that green. Thank you for the kind words. I confess, I would write up these investigations even if I knew that nobody was going to read them except myself at some later time. But it's nice to know that they're of some value to other people also. It's always worth thinking about lifecycle costs. Often they're hard to get a very precise handle on. In this case, there's one simple analysis that goes like this: Suppose you run a sequence of 60 watt bulbs for 10,000 hours. That's 600 KWH of electrical energy, plus whatever it took to make the bulbs in the first place. Do the same thing with the LED equivalent, and it takes less than 100 KWH plus manufacturing resources. Using conversion factors from the U.S. Energy Information Administration, the 500 KWH saved translates to 535 pounds of coal or correspondingly large amounts of other energy sources. So then the question comes, is there anything in the LED bulb manufacturing process that's nearly as bad for the environment as mining and burning 535 pounds of coal (or its substitutes) per bulb would be? My intuition says no, but on the other hand I don't have a handle on what all toxic crud comes out of any of the manufacturing process and how well that crud is kept out of the environment afterward.